Voted the Best Bed and Breakfast in St Augustine, Florida! When looking for a place to stay for lodging, whether a bed and breakfast or hotel in St Augustine, the Carriage Way is definitely the lodging jewel of this ancient city! We are proud to have the White Glove Housekeeping award. We have convenient off-street parking on-site for all of our guests. 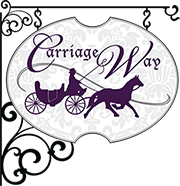 The Carriage Way bed and breakfast is just steps from old St. George Street: home of the walking mall with unique and charming shops, museums, historic St Augustine sites and beautiful views. The St Augustine Historic District is only a 2 minute stroll from the bed and breakfast. Come Experience St Augustine Florida! St Augustine Florida is the oldest city in the United States! Stay at one of the best bed and breakfasts in St. Augustine! As the oldest city in the United States there is a lot to see and do during your stay. Some of our "must see" favorites are The Castillo de San Marcos, The Lightner Museum, St. Augustine Lighthouse. The Castillo de San Marcos and many forts were part of fighting off pirates and invaders all the way back to the 1600s. The Lightner Museum is such a beautiful building of the Spanish Renaissance era. The St. Augustine Lighthouse is just awesome from the top and has a view of the entire city. The Old Town Trolley makes it easy to see St Augustine and with warm weather year round guests from around the country enjoy a break from cold weather. St Augustine is truly a beautiful history city. We recommend spending at least two to three days.